The Bondi to Bronte Ocean Swim has become one of the classics on the Sydney Ocean Swim calendar. This iconic journey swim runs between the first two Surf Life Saving clubs in the world. 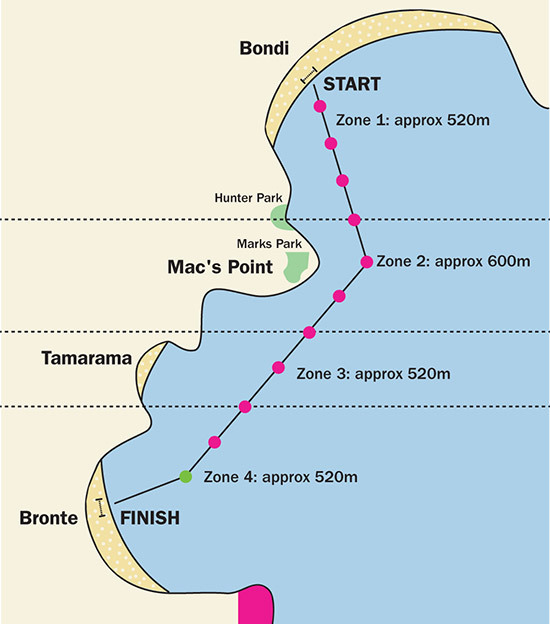 The course traditionally starts in front of Bondi Pavilion, runs out from Bondi, around Mackenzie’s Point and down the coast into Bronte Beach, a distance of 2.1 - 2.4km (depending on the positioning of the buoy off McKenzie’s point). All the buoys on the course are fluoro pink and we hang a large fluoro pink banner we hang from the south headland of Bronte, to give swimmers a long distance guide or in cases of big swell. The last buoy will be fluoro green so all swimmer know once they pass that buoy to head for Bronte Beach. The finish is traditionally positioned at the north end of Bronte Beach, however is dependent on conditions on the day. Once you sight the large finishing arch positioned on the beach, make your swim into the shore – but don’t forget to look behind you. Starting and finishing at two different beaches is one of the unique aspects of this journey. It gives all participants a sense of incredible personal achievement.